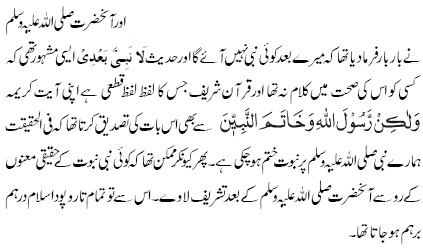 Hazrat Mirza Ghulam Ahmad declared again and again that his belief is that the Holy Prophet Muhammad is the Khatam-un-nabiyyin (or Khatam-ul-anbiya), and that this means that no prophet whatsoever can come after him. Some such statements are given below. Here we have quoted only those statements in which he has specifically used the terms Khatam-un-nabiyyin or Khatam-ul-anbiya. He has also made other statements, without reference to this term, again affirming that the Prophet Muhammad was the Last Prophet after whom no prophet whatsoever can come. Here he has translated the term Khatam-un-nabiyyin as meaning one to end the prophets (Urdu: khatam karnai wala hai nabiyon ka). “The fact that our Holy Prophet is the Khatam-ul-anbiya also requires the death of Jesus because if another prophet comes after him, he cannot remain the Khatam-ul-anbiya, nor can the type of revelation given to prophets be considered as terminated. 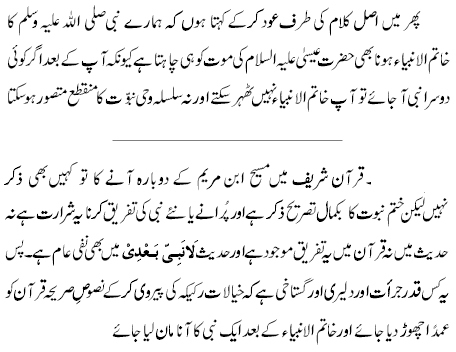 Here Hazrat Mirza has clearly taken the term Khatam-ul-anbiya about the Holy Prophet Muhammad to mean that the Prophet Muhammad was the Last Prophet after whom no prophet at all can come. “It should be believed from the bottom of the heart that prophethood has terminated with the Holy Prophet Muhammad, as God Almighty says: He is the Messenger of Allah and the Khatam-un-nabiyyin. To deny this verse, or to belittle it, is in fact to separate oneself from Islam.  Al-Hakam, 17 August 1899, p. 6. For further references from Haqiqat-ul-Wahy, see this link. In reply to the quotations presented above, we are told it was only until the year 1901 that Hazrat Mirza Ghulam Ahmad held the belief that Khatam-un-nabiyyin (or Khatam-ul-anbiya) means the Last Prophet after whom no prophet can come, and that in November 1901 he amended this belief by taking Khatam-un-nabiyyin to mean best but not last Prophet. We have already quoted above his statement from Haqiqat-ul-Wahy, and pointed to other references from the same book, showing that he expressed the same view in this book which was published in May 1907. Below we give some further statements after the year 1901 which make clear even to a common reader without much religious knowledge that Hazrat Mirza considered Khatam-un-nabiyyin to mean Last of the Prophets. Now the term Khatam-ul-kutub for the Holy Quran does not mean it is “the best but not last” of the revealed books. All Muslims believe that it brought revealed books to an end. So Khatam-un-nabiyyin in the same sentence also means the one who brought prophets to an end. In his book Barahin Ahmadiyya Part 5, which he began writing in 1905, he criticises his opponents for holding the mistaken belief that the prophet Jesus will return to this world again in the last days and he writes that according to this belief it is Jesus who would be the Khatam-ul-anbiya.  Barahin Ahmadiyya Part 5, p. 45. Ruhani Khaza’in, v. 21, p. 58. It is clear here that Khatam-ul-anbiya means only the last of the prophets, and certainly not the best of prophets. No Muslim believes that Jesus, by returning, can become the “best” of the prophets, but he would certainly become the last if he returned.  Barahin Ahmadiyya Part 5, p. 120. Ruhani Khaza’in, v. 21, p. 286. Here too Khatam-ul-anbiya can only mean the last of their prophets. The “best” of their prophets would be their great lawgiver Moses, and not their Messiah (who was Jesus). 20. In a footnote on the same page as above (Ruhani Khaza’in, v. 21, p. 286), Hazrat Mirza Ghulam Ahmad likens himself to Hazrat Abu Bakr, and writes that they both arose at a time of terrible anxiety for Islam when Muslims were deserting Islam, and they brought Muslims back to its fold. 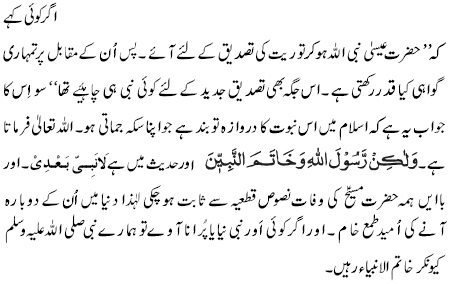 By likening himself to Hazrat Abu Bakr, he shows that he is not a prophet but a khalifa of the Holy Prophet. Jesus being the Khatam-ul-anbiya of the Israelite prophets means only that he was the last prophet to arise among them. Therefore the same term used here about the Holy Prophet means the last of the prophets that was to arise according to Islam. It must also be noted that as the Holy Prophet Muhammad was to be the last prophet ever to arise, it means that his authority as prophet, and the blessings received through following him, will continue forever. Images of the original Urdu texts of the above references are shown below.